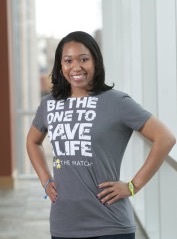 March is Women’s History Month and Be The Match is celebrating women saving lives. Did you know over half of the registrants in the National Marrow Donor Program, the world’s largest and most diverse marrow registry are female? These are regular, everyday women like you and me that are saving lives, making a difference and giving those suffering from blood cancer a fighting chance. Meet Erin. Her birthday wish at age 15 was to join the marrow registry. Disappointed to find out she could not join until age 18 she patiently waited and joined shortly after her 18th birthday. She was contacted by Be the Match 8 years later and told she was identified as a potential match for a 14 year old boy in need of a marrow transplant. A few months later, Erin donated peripheral blood stem cells in a 10 hour process over 2 days. On the Sunday before the transplant, Erin’s pastor said “Lord, help me to be the answer to somebody’s prayer.” That statement stuck with Erin and she realized she could be the answer to this boy and his family’s prayers. What an incredible opportunity! Read Erin’s full story here. This entry was posted on March 30, 2015 by youcanmakemestronger in Story and tagged #bethematch, #bonemarrowregistry, #pbscdonation, #womenshistorymonth.